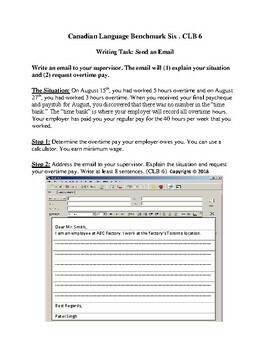 Ideal for the multi-level LINC or ESL classroom, this assessment is one of two differentiated tasks (CLB5 and CLB6) on writing an email that allows the multi-level classroom to work on the same task while each learner receives a task that meets the Canadian Language Benchmark criteria for their CLB writing level. The Send an Email Task for CLB5 is also available for purchase from this TPT store. This CLB6 writing task comes ready to print and distribute to your CLB6 learners. 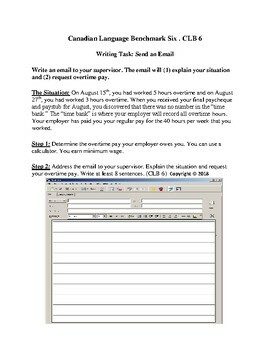 This writing task will allow you to informally assess the vocabulary knowledge and writing abilities of learners based on email style writing and writing for work purposes. Please ensure that you have done a lesson on sending / writing an email and learners have had prior practice writing for work purposes. (Examples of vocabulary to have covered prior to task: Dear Sir / Madam, Dear Mr. Smith, Dear Ms. Jones, Regards, Best Regards, Kind Regards). As with any CLB task, please double check that the writing assessment given to a learner specifically matches the writing assessment level that learner is working towards. For example, if a learner is at a Pre-Benchmark (PB) level, this learner will receive the CLB 1 reading assessment, as this is the level the learner is working towards earning. Enjoy your day of teaching on this writing topic. Store Motto: For the cost of a cup of coffee, save hours of classroom planning! Would you like to support animal rescue? from the dog meat industry in China and animal abuse. The video is of four dogs that were rescued on March 10, 2019.
until adopted to caring homes in the United States.